1M TRIS pH 7.0, 100 ML. ACRYLAMIDE/BIS - 19:1, 500 ML. pSILENCER 2.1-U6 PURO, 20 UL. PROTEINASE K POWDER, 500 MG.
100 PLG X TRIZOL LS, 100 ML. DYNABEADS M-270 STREPTAVIDIN, 10 ML. DYNABEADS M-270 STREPTAVIDIN, 2 ML. NUCPREP PROTEINASE K SOLN, 5 ML. 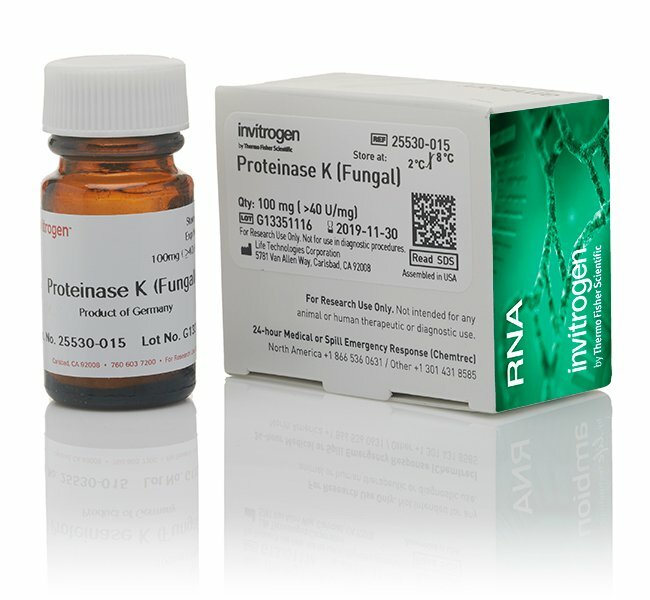 PROTEINASE K (SOLUTION), 5 ML. DYNABEADS M-270 AMINE, 2 ML. HEAT GERM AGGLUTININ, AL, 5 MG.
TRANSFERRIN FROM HUMAN SE, 5 MG.
SYTO 16 GREEN FLUORESCENE NUCLEIC STAIN, 250 UL. SYTO 63 RED FLUORESCEN, 250 UL. RHODAMINE RED C2 MALEIMIDE, 5 MG. GOAT ANTI-MOUSE IgG SECONDARY ANTIBODY, ALEXA FLUOR 594, 2x2.5 ML. NUCRED LIVE 647 READYPROBES, 6X2.5 ML. CELL TRACKER GREEN CMFDA, 1 MG.
CELLLIGHT LYSOSOMES-RFP, BACMAM 2.0, 1 ML. CELLLIGHT LATE ENDOSOMES-RFP, BACMAM 2.0, 1 ML.